Connects the kundalini and hara lines at the root or base chakra and aids in drawing Earth Energy into the body and opening the Heart. Starts the flow of Ch'i Kung through the hara line and increases the life force energy through our hara channels. Red Tiger's Eye has a Trigonal crystal system, is formed in a tertiary manner and is in the mineral class of oxide, the Quartz group. The silky sheen and beautiful shimmers seen in this stone are created during its formation process. With Quartz as its base, Crodicolite (asbestos) is trapped within the crystal. The fibers are generally twisted or crumpled which accounts for the various patterns. The amount of oxidation that occurs during its formation determines the coloring. In the red shades, much oxidation has occurred and the red coloring of the oxidized Crodicolite prevails. 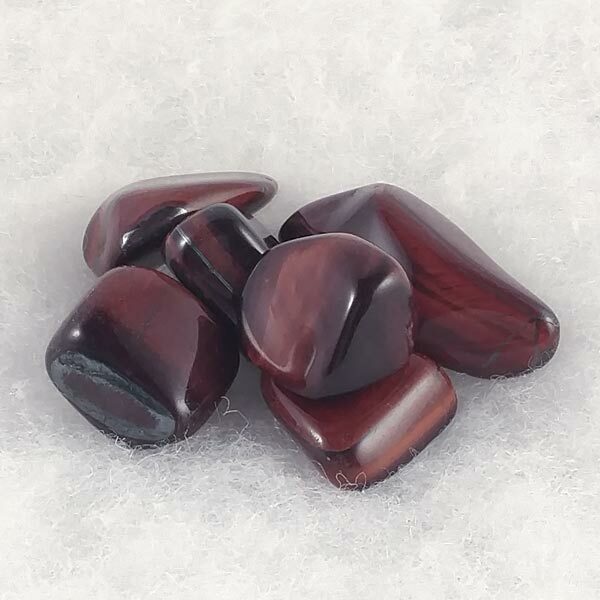 As with most stones, Red Tiger's Eye are best used when held or laid upon the body. In it's shade of red, it can be quite beneficial when used at the Heart Chakra. 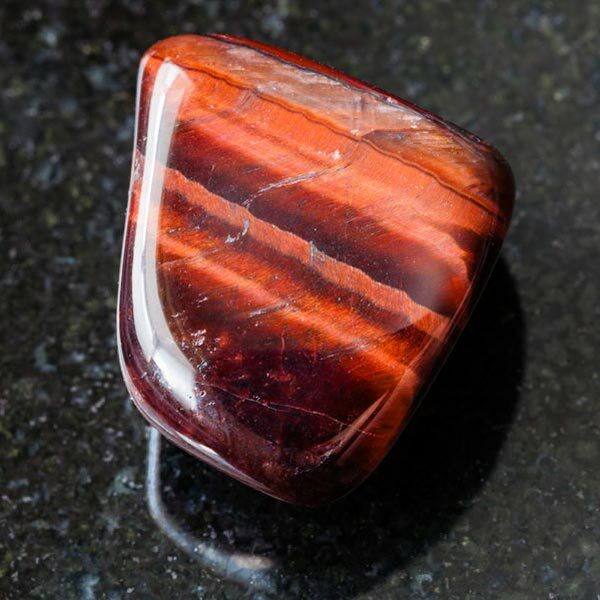 Red Tiger's Eye promotes love and balance and allows us to be open to new spiritual knowledge and feeling connected to others with the same insights. Red Tiger's Eye, like the Blue, promotes the balancing of yin/yang energy, and also promotes a passion for life and its experiences. Red Tiger's Eye can bring compassion and empathy in considering the needs of those close to us as well as our own needs. It can assist us in letting go of thoughts that we are not worthy of love and fosters a healthy self-image of ourselves which will reflect to those around us. Red Tiger's Eye can have a pain relieving effect. It has been used for relief from coronary heart disease, to reduce blood pressure from its calming effect, and for release of emotional grief quite effectively. Tiger's Eye, of every color, has a special affinity with the Earth Signs. In red, it has a special affinity with Capricorn. It has a Projective Energy, its Planet is the Sun and its Element is Fire. In any shade, Tiger's Eye carries the powers of protection against many forms of danger. The Red variety is nice to hold in the sun and gaze at its flashes of light. It has been written that if you still your mind and gaze into the stone you can delve into past lives or gaze to the future.